Last Thursday, 12 Latino workers at a small bar and grill in Tulsa didn’t show up for work. In solidarity with immigrants across America, they were taking part in the ‘Day Without Immigrants’, a strike designed to highlight just how important immigrants are to the country’s businesses and economy. But for the workers in Tulsa, the strike didn’t end so well – they were fired by text, pretty much immediately. 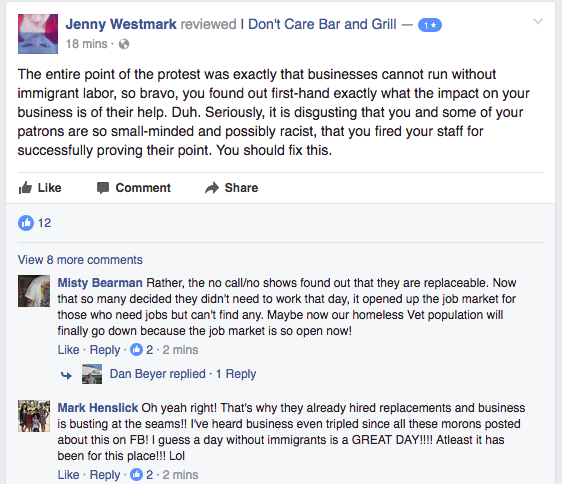 Now people are making their views heard on the Bar and Grill’s Facebook page, debating whether the workers had the right to strike, or whether the manager was just doing what was necessary to keep his business going. The I Don’t Care Bar and Grill is the only place for miles around. It's a popular spot for truckers headed to the nearby port of Catoosa, or those making the hour long commute from Tulsa to the industrial park in Pryor. 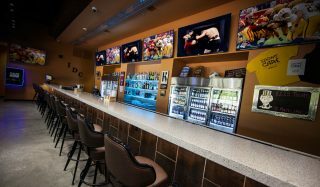 If you haven't heard of either of those cities, no one would blame you; the I Don't Care Bar and Grill is between two nowheres, which has made it a pretty popular spot even though it only opened two years ago. So how justifiable was his move? The bar owner had made his zero-tolerance policy for no-shows at work clear, and has fired people in the past for missing work without notice. The 12 workers who protested didn't give prior notice that they wouldn't be at work, so in a sense they must have known what was coming. Labor laws in the US and specifically Oklahoma are on the owner’s side too. Employees can’t be fired for a lawful strike – but the Day Without Immigrants doesn’t necessarily count as one anyway because it wasn’t organized for a specific goal, like higher wages, and wasn’t organized by any labor organization, like a union. Oklahoma is notoriously tough on unions and organized labor in general. People can be fired pretty much for any reason at any time, and would need a very strong case for discrimination and unfair practice to be able to appeal. It’s a “right to work” state which means unions are not allowed to force workers to pay dues, even when workers benefit from the union’s activities. With the odds so stacked against them, why did the workers do it? They’ve indicated in interviews that they didn’t expect to get fired. Seeing as they make up such a significant portion of the staff, they didn’t think the owner would fire so many people at once. This safety in numbers is what makes unions and strikes work – so-called ‘collective bargaining’, or the idea that the more workers band together to demand rights or compensation from their management, the more likely they’ll get it because the employer won’t want to lose so many workers at once. The logic doesn’t seem to have worked – mostly likely because the owner knew he could rely on the conservative clientele to keep coming back. IDC’s Facebook page has blown up with customers expressing their support or disappointment in the owner’s choices. Ultimately, they’ll hold the restaurant accountable with their money, and given the area they’re in, it’s likely the restaurant won’t lose business – it may even win some. But if the 12 workers intended to get attention first and foremost, they’ve been pretty successful. 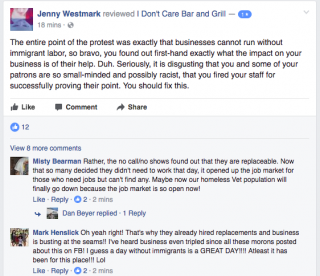 From the thousands of social media posts to international media coverage, they and the 100 or so other workers fired for their actions last Thursday managed to get people talking about immigration, workers rights, and how America runs its businesses. 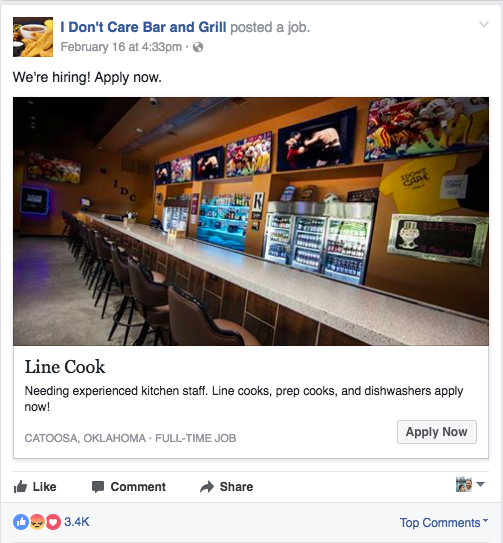 Plus, they got offered jobs at Brownies, another restaurant in Tulsa, pretty much straight away.